In 1927 Cecil and Sheila Durham milked seven Jersey cows in an orange orchard in the backyard of their uncle's home in central Dundee, delivering nutritious Jersey Milk by bicycle to their customer's homes in one gallon (4,5 litre) milk cans. 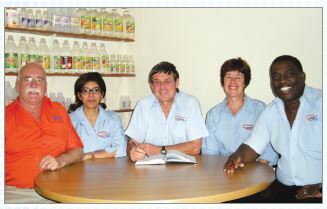 Today, 85 years later, their grandson Dave Durham and his wife Sue still own Orange Grove Dairy, and together with their management team Jabulani Khanyile, Guy Devereux and Beverley Christians, have grown it into a successful dynamic business manufacturing and distributing a range of more than 200 dairy and fruit juice products. From seven cows in an orange orchard to one of South Africa's biggest private fresh milk product dairies, Orange Grove's success story is one hard work and team effort. Many of Orange Grove Dairy's products include the highprotein, mineral and energy-rich milk from Pete Durham's Glynton Jersey Herd, which has grown from the original seven Jersey cows into one of South Africa's largest and top pedigree Jersey herds. All milk is produced naturally without the use of artificial hormones, and the cows are fed a carefully balanced diet to ensure their own good health and to produce milk naturally rich in protein, vitamins and minerals. Milk from the Glynton Jersey herd is sold by Orange Grove under the exclusive "Jersey Gold" brand. Orange Grove Dairy's product range has come a long way from only supplying milk, and today includes a full range of milk, maas, yoghurts, cream, 100% juices, nectars and dairy fruit blends under strong well recognized brands such as Jersey Gold, Insengwakazi, Isibhakela, Umfutho, Natures Best, Natures Nectar and Tango. Tango, a tasty blend of real fruit juice and milk was one of the first dairy blends in South Africa. Orange Grove also boasts 'first time' flavours in their Nature's Best 100% fruit juice range, 7 Fruits 7 Vitamins, Pom-a-Berry (a blend of pomegranate and cranberry juice) and Fruit Boost, which is multi fruit and vitamin fruit juice enriched with fibre. All 100% Juices and Nectars are enriched with 7 vitamins for healthy boost to their refreshing taste. Orange Grove Dairy takes great pride in creating quality products that are relevant to the market needs and competitively priced. Milk is supplied by 35 dairy farmers who range in size from 200 to 30 000 litres per day and whose farmers are scattered throughout KwaZulu Natal, from the midlands districts of Boston and Mooi River to Utrecht in the foothills of the majestic Drakensberg. The Orange Grove Buyers Association was started as a means for Orange Grove Dairy and its milk suppliers to pool their resources. Both large and small farmers benefit from the association as individual buying power is increased and enables the negotiation of better prices for farm inputs. It also acts as a forum in which knowledge and information regarding best farming practices is shared between members. The successful range of juices is developed and supplied by Magalies Citrus. Orange Grove Dairy distributes throughout KwaZulu Natal and Gauteng from five distribution centres - Dundee, Durban, Empangeni, Pietermaritzburg and Alberton. Slick planning, a fleet of Mercedes milk tankers and refrigerated trucks, together with a dedicated team which includes franchisees and agents, makes it possible to milk the cows, process and pack today and deliver fresh milk to our customers by tomorrow morning. Daily distribution not only takes Orange Grove products to the cities and towns but also deep into rural areas such as Tugela Ferry, Nongoma, Hlabisa and Kosi Bay. Orange Grove's over 800 customers include the larger chain stores (Boxer, CBW, Jwayelani, OK Grocer, Pick n Pay, Rhino, Shoprite Checkers, Spar) wholesalers, supermarkets, cafes, catering groups and the smallest of tuck shops. 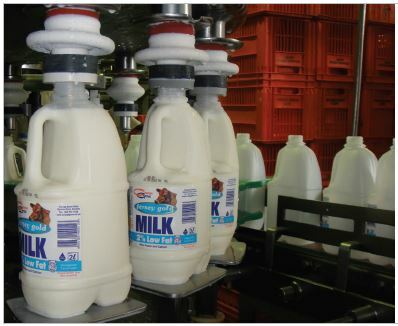 The supply of bottles to Orange Grove has grown over the years to the point that Nampak Liquid Packaging established a bottle blow molding factory at Orange Grove Dairy in 2005 and most of the products are packed into bottles manufactured on site. The bottles are blown over from the blow molding machines into the filling machines. This greatly reduces handling and any risk of contamination. Orange Grove Dairy is the only private dairy with a packaging factory on site. Orange Grove Dairy won the 2009 KwaZulu Natal Top Business Award in the agricultural sector, which recognises those companies that are making a significant contribution to the province's economic, social growth and development. Orange Grove's on-going involvement in the community is reflected in its support for numerous projects including the Dundee Crises Centre, Melusi Mission, Umzinyathi Community Education Centre, Arrive Alive, Police Crime Report Project and various feeding schemes. The company is also committed to various sport sponsorships for events as well as for individuals such as Comrades' runners and top local athletes. Orange Grove actively supports the HIV/Aids awareness programmes of Dundee and Umzinyathi. Orange Grove Dairy's success is truly a team effort. The top quality fresh milk from our farmers, the support of local businesses, dedicated and hard working staff and loyal suppliers and customers, have all helped to ensure that Orange Grove is the success it is today. To build a dynamic, market sensitive, secure and profitable dairy based business with strong brands, loyal and happy customers and suppliers, committed, well trained and motivated staff with mutually beneficial relations and opportunities to all concerned including our communities and our environment based on our core values of honesty, integrity, loyalty and good value. To ensure excellence in the production, marketing and distribution of dairy and related services to the mutual benefit of all parties involved.